Yesterday we came back to Hanoi after spending 2 days cruising the Halong Bay and we are extremely happy and grateful we had the opportunity to visit such an amazing place. We knew beforehand this bay was included in the Unesco list of world heritage sites, we read in different guides this place was one of the most beautiful ones in the northern part of Vietnam and that we were told this "descending dragon bay" was composed by thousands of limestones islets creating a very special and mystic place. Despite this high expectations, we still were amazed by the hundreds of limestones we found on our way and by the beautiful sunset and sunrise we were able to experience on our cruise. We came back to Hanoi completely satisfied and delighted we embarked on a Halong Bay Cruise for 2 days and 1 night. 1. Online shopping around was very important. Some weeks ago I wrote on this blog that knowledge is definitively a time saver when visiting a new city. 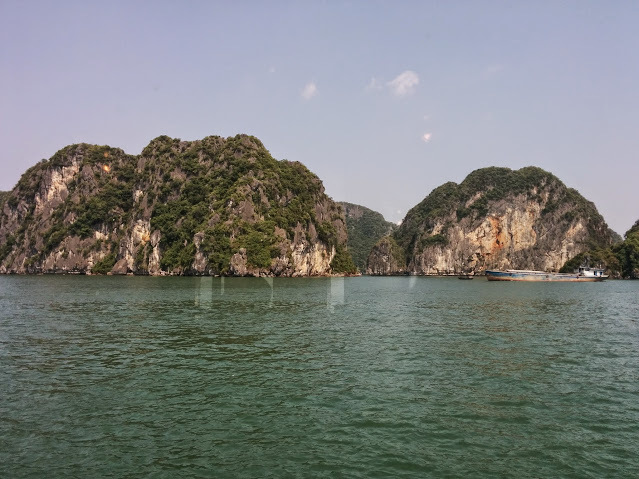 This principle applies also to unknown attractions and in the case of the Halong Bay it turned to be one of the keys on getting a really good experience. We were a bit apprehensive because of nightmarish stories of cruise experiences depicted in blog posts and travel portal reviews. There were quite some stories about tourists being ripped off in the jungle of “budget” offers with rude operators trying to cram as many tourists as possible in crappy and slow boats, offering horrible food and cabins with rats and sea water included. After all this research we concluded that if we wanted to do this trip we wanted to do it, the nicest possible way but still without paying a fortune, so we selected of the best value options on the high end range. After some good hours comparing cruise alternatives and prices we went for the Emeraude Cruise offer. When we booked this cruise the good reviews and the relatively good price (still pricey) lean us to chose this alternative. 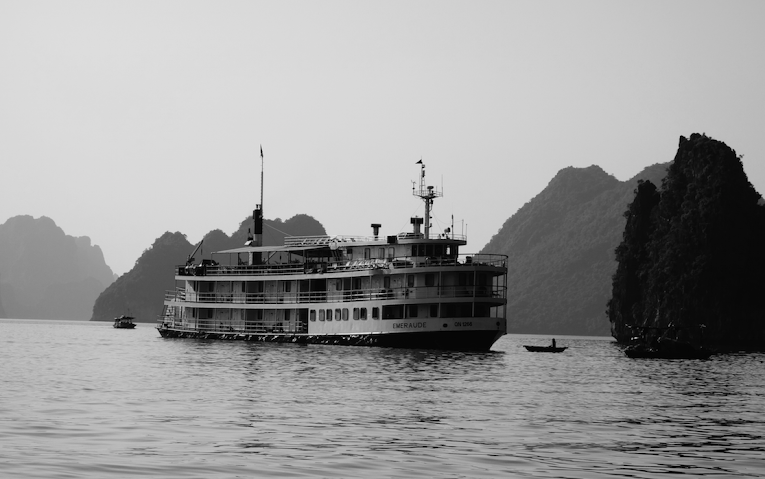 In the following days we read more and realized we chose an interesting "alternative" way of cruising the Halong Bay. They do it using a replica paddle steamer that looks quite like the original with the exception of the paddles that have been replaced by a swimming deck. We learned during our trip that a French entrepreneur found the original Emeraude steamer in an old postcard and after some sherlock holmes type of detective work he was able to find the descendants of the original Roque family that owned the original flotilla, including the Emeraude. He went about to recreate it and in 2003 this boat was put in service. The result is impressive as you can see in the black and white picture above. It was very nice to board it and to feel transported back in time. Hanoi is located ~3.5 hour away from Halong City where our cruise was leaving the port. The company offered a transport option to get us there, so we boarded a minibus that picked us up at our hotel located in the old quarter district of Hanoi. 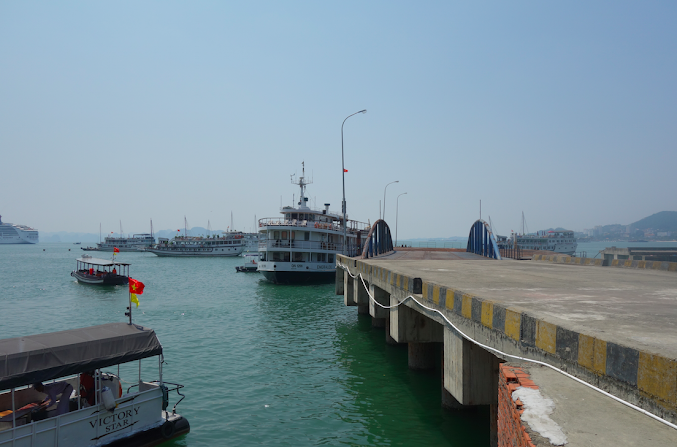 Once we arrived to Halong city they welcomed us in their own cafe, they explained the different safety procedures of the boat and they gave us the key of our cabin. We proceeded to board the Emeraude ship that was anchored in the port and were welcomed on board with a hibiscus and apple juice drink. 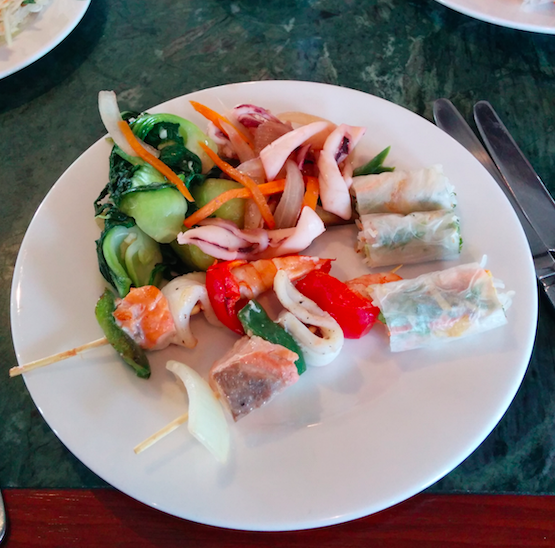 Then we left our stuff in the cabin and proceeded to eat a yummy vietnamese buffet lunch at the main restaurant while the boat started to move and sail the bay. This post is getting a bit too long so I will split it in two parts. To be continued….